On Friday, I went to Buckingham Palace with my mum. The Palace was designed by King George IV. And then I realised, I haven’t done a Monarch 101 for ages! So, for a special Buckingham Palace 101, let’s talk about the creator of Buckingham Palace, George IV! This guy…. is FAT! He’s REALLY, REALLY FAT! His portrait showed him like a normal size man, but in reality he was FAT! However, he was a great architect, designing Brighton Pavilion and Buckingham Palace. If you go to Buckingham Palace, you will see lots of George IV portraits. As a young man, George was forced into the spotlight when his father, George III went mad. So anyway, George IV became Prince Regent, and things went ‘pretty well’. Of COURSE NOT! In 1785, he illegally married a Catholic, Maria Fitzherbert, without the king knowing. But 10 years later, the king chose a wife from Germany to help George pay off his dept. AND George didn’t like her. And when he became King, he banned her from his coronation. 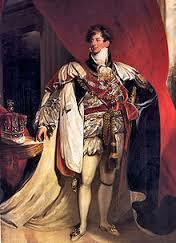 As King, his reign was pretty solid except the war of 1814 with America. This war was significant in American history. When he died, he wasn’t mourned and one newspaper even insulted him, saying “There never was an individual less regretted by his fellow creatures than this deceased king”. Bit harsh. I have learned something new. I had always believed that George was only a patron of the arts and left the actual planning and execution to others like Nash and Holland. Thank you for putting me straight. I wrote a post about my visit with Ben to Buckingham Palace in this post Magnificent Display at Buckingham Palace. We visited the same place but we were attracted by different things. It was a wonderful day for us and I also stood at the Music Room, where the new royal baby boy George will be baptised. It’s a rather small room overlooking a huge garden. Inside the Palace, we also saw the Queen’s Coronation ceremony in colour. I believe people used to watch the Coronation on a black-and-white television. It was very interesting to see the event 60 years ago in full colour. Do you know that Maria Fitzherbert was local to you? There’s some information about her in one of the pubs in the town centre – but you’ll have to wait until you’re 18 to go and read it! Cool. We’ll go there. I still owe you a drink. He had some help but he was a keen patron of the arts. He was actually very popular in his youth, as well as slim and handsome. His nickname was ‘Prince Florizel’, from Shakespeare.